Start off your visit on the 12th (Tue): get great views at Mirador Ing. 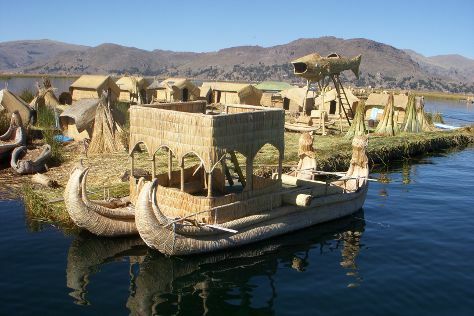 Eduardo Sanchez and then step off the mainland to explore Uros Floating Islands. To find traveler tips, maps, and tourist information, use the Puno travel planner. Curitiba, Brazil to Puno is an approximately 16-hour combination of flight and bus. You can also drive; or do a combination of taxi and bus. Due to the time zone difference, you'll gain 2 hours traveling from Curitiba to Puno. When traveling from Curitiba in February, plan for little chillier days and cooler nights in Puno: temperatures range from 20°C by day to 5°C at night. Wrap up your sightseeing by early afternoon on the 12th (Tue) to allow enough time to travel to Cusco. Ask Inspirock to suggest an itinerary and make planning a trip to Cusco fast, fun, and easy. Do a combination of bus and flight from Puno to Cusco in 3 hours. Alternatively, you can drive; or take a bus. Traveling from Puno in February, expect a bit warmer with lows of 9°C in Cusco. Wrap up your sightseeing on the 12th (Tue) early enough to travel back home.